YAF, a conservative group that was partially funding the event, pulled its involvement in the event Tuesday because of safety concerns. The group, however, will continue to pursue the lawsuit against the campus. 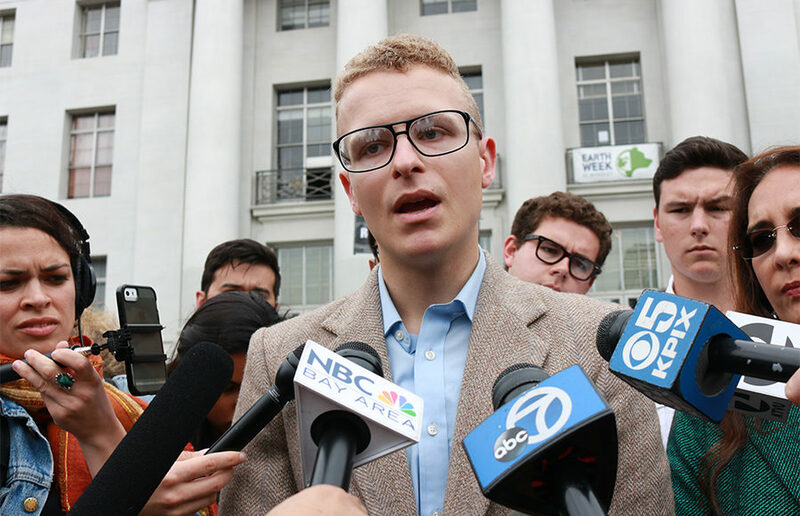 “The excuse used by UC Berkeley to suppress speech here in this case is one manufactured by the university’s inaction compounded by city of Berkeley’s police department’s inaction,” said Harmeet Dhillon, Coulter’s lawyer, at the press conference. 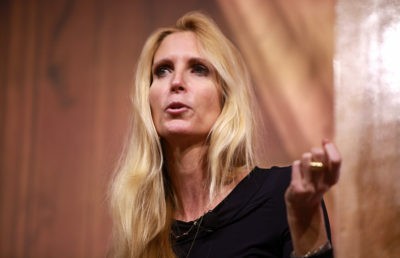 In March, BCR and BridgeUSA invited Coulter to address the campus community April 27. The campus postponed her event to September on April 19 but then extended an invitation for her to speak May 2 instead of April 27. Coulter refused to speak May 2 and had publicly stated she intended to speak on campus April 27. It’s sickening when a radical thuggish institution like Berkeley can so easily snuff out the cherished American right to free speech. “The BCR will continue to invite conservative speakers to this campus in an effort to secure the mantle of the home of the Free Speech Movement,” said BCR member Troy Worden at the press conference. During the press conference, Reiko Redmonde, manager of Revolution Books on Durant Avenue, led a protest challenging BCR. Students participated by taking turns addressing spectators with a megaphone. Hoku Jeffrey, a national organizer for By Any Means Necessary, or BAMN, said he considered Ann Coulter’s cancellation “a real victory.” In an address to the crowd gathered on Sproul Plaza, former ASUC presidential candidate Richard Alvarado added that racism and xenophobia should not be tolerated anywhere. The campus has not heard from Coulter directly, according to campus spokesperson Dan Mogulof. During a campus press conference Wednesday afternoon, UCPD Capt. Alex Yao announced that campus police will continue with planned security procedures in place for tomorrow. During the press conference, Mogulof also denied the existence of a “high-profile speaker policy,” stating that every campus event is assessed on its own merit. Yao added that in the case of any event occurring on campus property, UCPD conducts an independent review and threat assessment. Yao said at the press conference that UCPD will have a “very, very low tolerance for any sort of violence on campus” tomorrow. He also encouraged students to look to Nixle and WarnMe for security updates. In an email sent to the Berkeley High School community, Berkeley High Principal Erin Schweng detailed a series of security measures that the high school will be taking tomorrow to ensure that its students remain safe during potential protests. These measures include the presence of extra safety staff, the closure of the Allston Way entrance of the high school after 9 a.m. and consistent contact with Berkeley Police Department, according to the email. According to Mogulof, the campus has spent potentially more than tens of thousands of dollars on security for this event. Mogulof said at the press conference that should BCR approach campus with a desire to reschedule Coulter’s talk, campus administrators remain ready to collaborate with the organization. In a campuswide email, UC Berkeley Chancellor Nicholas Dirks advised campus students and staff to avoid Sproul Plaza tomorrow if they do not wish to participate in any potential protests. Dirks encouraged students who do wish to participate, however, to protest safely. Access to Sproul Hall and the Martin Luther King Jr. Student Union will be restricted, according to Dirks’ email. BridgeUSA at Berkeley began discussing pulling its support of the event Friday when Coulter announced that she would be speaking on Sproul Plaza the following week, according to BridgeUSA at Berkeley Co-president Manu Meel. 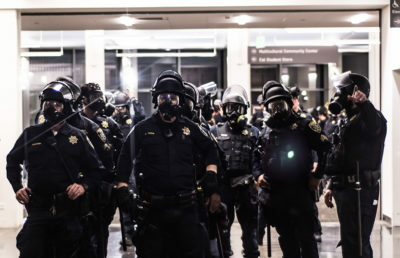 Despite the cancellation of Coulter’s talk, multiple demonstrations have been planned for tomorrow, including a “Fight the Right!” rally at Bancroft Way and Telegraph Avenue and an alt-right rally at the Martin Luther King Jr. Civic Center Park.